Yes, today, is Janice's Birthday. So all together now, HAPPY BIRTHDAY TO YOU. One of the perks of being the partner who writes the blog is I can choose what to write about. So while Janice would not share the announcement of her birthday, I will. I guess it would not be politically to correct to tell you her age, so let me just say that first, she is older than me. (I just love that) This would be when Janice would tell you she is only 9 months older than me. Second, I will tell you that she graduated from high school one year before me. (Nine months can mean alot.) Third, and the best clue of all, Janice and I share different decades. Fourth, just in case you haven't got it yet, IT'S A BIGGEY. Enough about her age, although it is an important birthday milestone, because it's not the age, it is the miles. Wait, I think that is for cars. I know we have talked about having a contest, but no, you cannot win a prize for guessing Janice's age. Sorry. 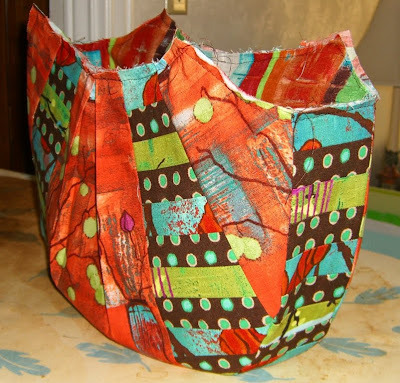 There is a bit of quilting news in this birthday blog. We received an email about the Abbey Bag from Melanie. It includes a tip for putting the bag together. I used a double strand of crochet cotton in a matching color, ran the needle up through the pin cushion, as instructed, attaching the button and back down.....but before securing it, I used a few dots of fabric/craft glue under the button, pulled the threads through and secured! Voila! Nice and secure. Ok, just one more thing, let's all wish Janice a Happy Birthday again. We finished the new purse today, handles and all. We absolutely love this bag. It is a perfect size and has a great shape. The inside has two pockets, big enough for all my lip glosses and my pda. It has a button closure to hold everything safe. Now, the fun part, a name. As far as bags go, we are up to the letter "F". We have been searching for a good name. 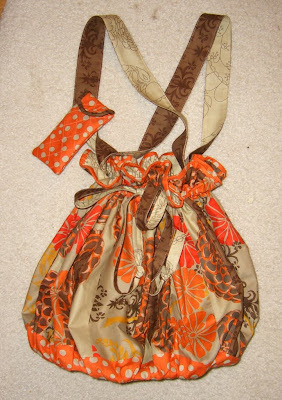 Janice's daughter-in-law, Nicole, was the one who gave us the idea for the bag, she would like the name to be "Nicolette." I have taken a liking to "MAGGIE MAY." We are open for suggestions, however, you know our theme, Beatle Manie. So let us know. 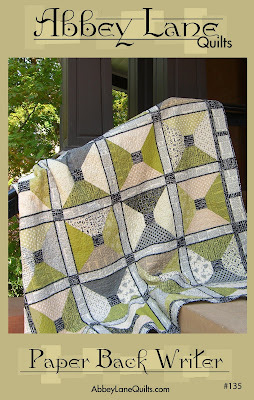 Oh yeah, the only bad news, the pattern will not be ready until Quilt Market, the middle of October. 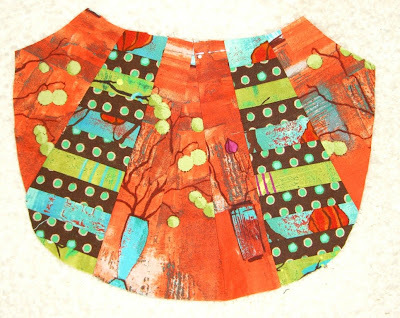 We will have several more fabric versions, though, between now and then. The good news, "PAPER BACK WRITER" is now available. 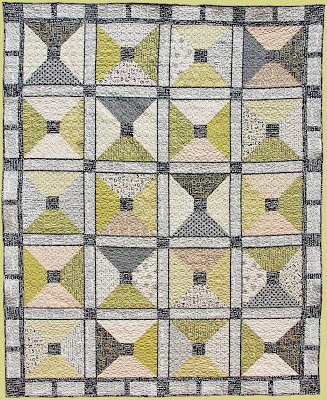 We used a fabric collection from Moda, "AUTHENTIC", which is shipping hopefully this week into your local store. 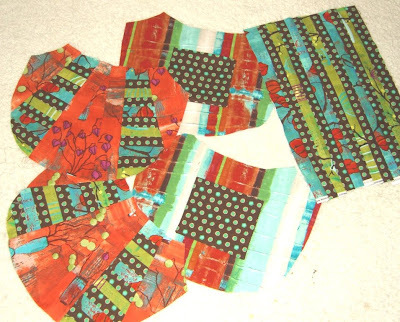 The quilt uses 20 fat quarters and some yardage. The pattern is for sale on our website, http://www.abbeylanequilts.com/. That is it for today. 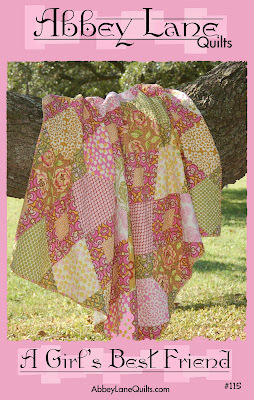 We are waiting for fabric from Moda for two more new quilts for Market. We have a couple of other surprises in store. Have a great week, and we would love help on the name for the new bag. 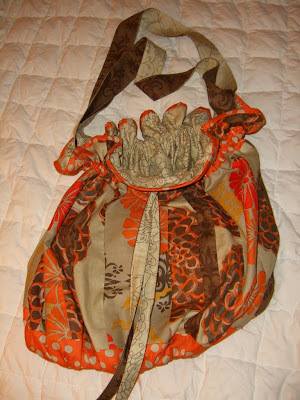 I have a very large collection of purses and bags. I have spent quite a few years collected. My mother had a huge collection also. The thing I have learned about purses is while there are endless beautiful bags, the bag I like is not necessarily the bag you might like. 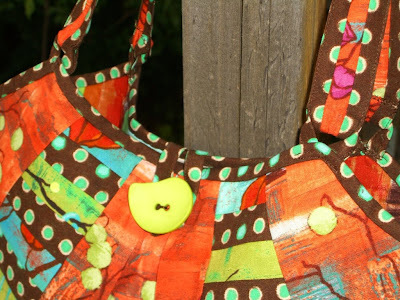 That's what is so great about a cloth bag that you make. 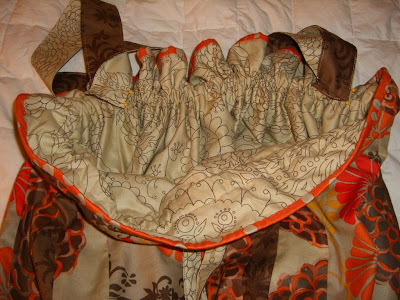 We all get to personlize a great design by chosing fabrics we love. The newest bag, yet to be named, is like that. 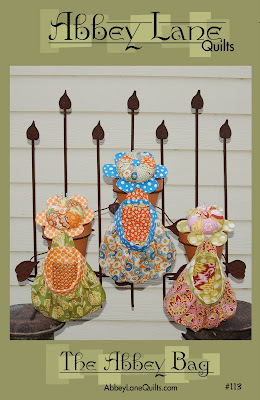 I LOVE the fabrics I used. 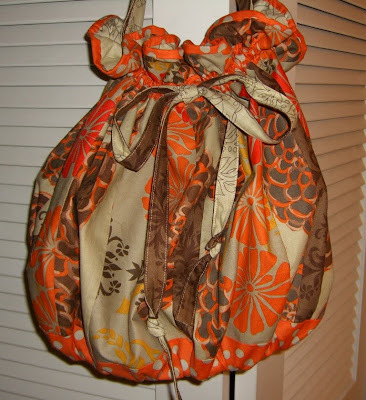 It is also designed to make with leftover scraps or your favorites or those cute little Honey Buns from Moda. 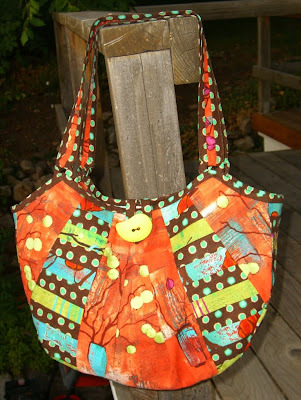 Add a little yardage and you have a purse you will love. Even though it is not done yet, I had to show you some sneak peaks. 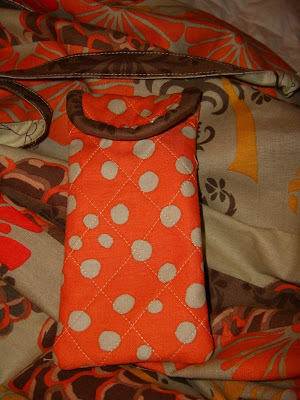 Since I took the pictures, I have added a binding, and tomorrow I will add the handles. It is a great design. Not to big, but still has plenty of room. There will be two pockets on the inside. How could you even think of having a bag without pockets. Here are all the pieces ready to be put together. Here is one of the front panel. 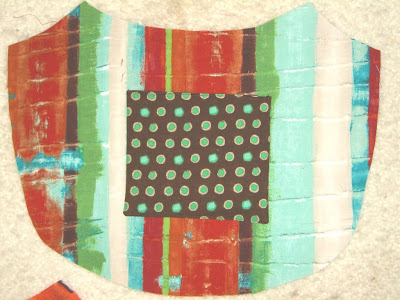 The striped pieces are made from little 1 1/2" strips sewn together. This beautiful piece is the inside of the bag. You can't go wrong with a polka dot pocket. Here it is. I just love it. 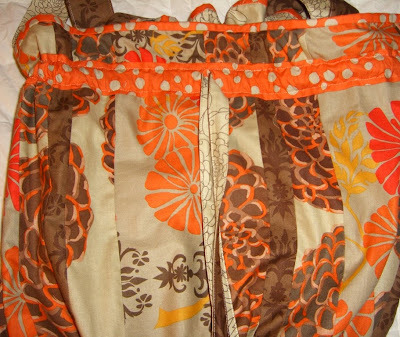 The binding will be that cute brown polka dot. There are also a couple of other surprises. Here is the side view. Love the piecing. Ok that is all the pictures for now. Having so much fun with this bag, forgot to tell you the other news. We finished another design today for RJR Fabrics. The fabric isn't even coming out until late next spring. It is scheduled for a magazine next summer. No sneak peaks on this project. 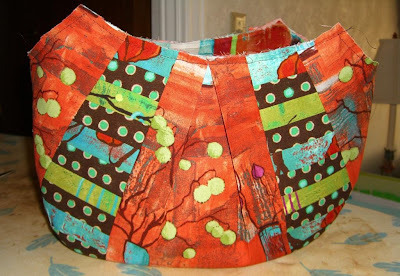 More news, Janice finished quilting Paper Back Writer and the pattern is written. All that is left is the cover shot and it will ready next Monday. 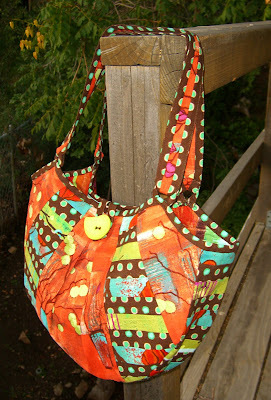 Photos of the finished purse and Paper Back Writer coming this weekend. Thanks for checking in and have a great holiday.